This summer I did something on a whim. I submitted a poem I wrote to a magazine. It was during that single productive week of summer before the days meld into a blur of books, sun, sweating drinking glasses, and dirty feet. And I kind of forgot about it until I got a email saying that my poem had been accepted for publication. And it wasn’t until then that I realized how stupid it is to write things and never show them to anyone. A few months later the literary magazine that accepted my poem printed my bio, but forgot to print my poem (ha! ), which doesn’t really lend much credibility to the stunning nature of the poem I submitted, but made me think that maybe I should try to submit things in a few other places. I have so many friends who do creative things and share them, and I rarely do that, mostly because I’m a wimp. So here’s my effort not to be, even if I’m no good, even if only my bio is worth printing. Here’s me not being a wimp. Yawp! Right now I’m reveling in the glory that is rejection notices and waiting. Wish me luck. I’m hoping for you, too, creative friends. Love it! What magazine did you get in (your bio at least)? I’m a specialist in rejection letters from poetry magazines. I was just thinking yesterday how it’s about time to send out another batch. I’m right there with ya, sista! 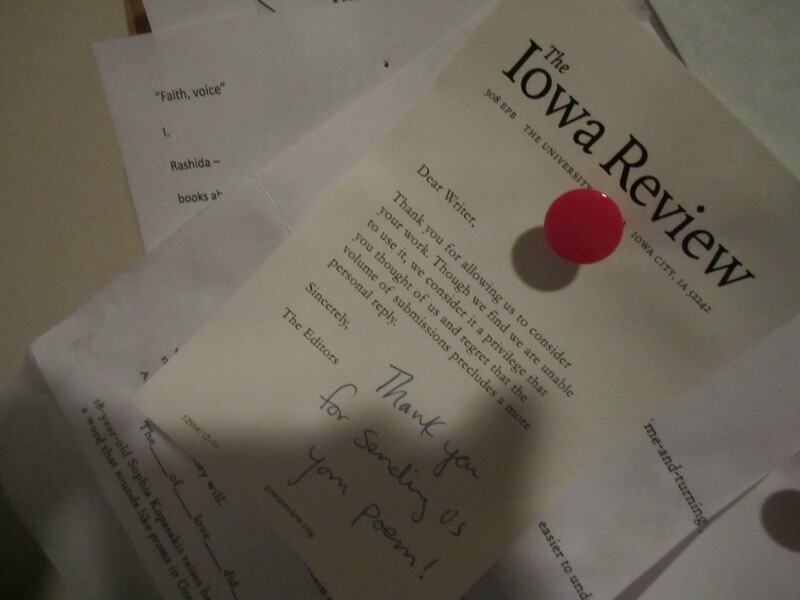 The Iowa Review! How amazing. Congrats, and keep on submitting!